Historical version for the period July 1, 2007 to December 15, 2009. Last amendment: O. Reg. 179/07. “working space” means any space where persons are engaged in the performance of work within a foundry but does not include offices, lunch rooms, locker rooms, change rooms, rest rooms, washrooms, shower rooms, toilet rooms, pattern shops, maintenance shops, laboratories, shipping areas, the storage space occupied by equipment or materials not regularly in use or the enclosed space where core sands and moulding sands are stored. R.R.O. 1990, Reg. 851, s. 1; O. Reg. 516/92, s. 1; O. Reg. 629/05, s. 1. “performance” means a performance of any kind, including theatre, dance, ice skating, comedy, musical productions, variety, circus, concerts, opera, modelling and voice-overs, and “performer” has a corresponding meaning. O. Reg. 179/07, s. 1. (c) at least one other worker equipped with a suitable alarm and capable of rendering any necessary assistance is keeping watch nearby. R.R.O. 1990, Reg. 851, s. 50; O. Reg. 629/05, s. 3. “related work” means work that is performed near a confined space in direct support of work inside the confined space. O. Reg. 629/05, s. 5. (ii) is working under the direction of a fire department, as defined in the Fire Protection and Prevention Act, 1997. O. Reg. 629/05, s. 5. (c) written procedures and other measures developed by that employer. O. Reg. 629/05, s. 5. (3) This Part does not apply to work performed underwater by a diver during a diving operation, as defined in Ontario Regulation 629/94 (Diving Operations) made under the Act. O. Reg. 629/05, s. 5. 119.3 (1) This section applies if the workers of more than one employer perform work in the same confined space or related work with respect to the same confined space. O. Reg. 629/05, s. 5. (2) Before any worker enters the confined space or begins related work with respect to the confined space, the lead employer shall prepare a co-ordination document to ensure that the duties imposed on employers by sections 119.4 to 119.6, 119.8 to 119.11 and 119.13 to 119.19 are performed in a way that protects the health and safety of all workers who perform work in the confined space or related work with respect to the confined space. O. Reg. 629/05, s. 5. (3) Without restricting the generality of subsection (2), the co-ordination document may provide for the performance of a duty or duties referred to in that subsection by one or more employers on behalf of one or more other employers, with respect to some or all of the workers. O. Reg. 629/05, s. 5. (b) the joint health and safety committee or health and safety representative, if any, for each employer of workers who perform work in the same confined space or related work with respect to the same confined space. O. Reg. 629/05, s. 5. 119.4 (1) If an employer’s workplace includes a confined space that workers may enter to perform work, the employer shall ensure that a written program for the confined space is developed and maintained in accordance with this Part before a worker enters the confined space. O. Reg. 629/05, s. 5. (2) The program may apply to one or more confined spaces. O. Reg. 629/05, s. 5. (3) The program shall be developed and maintained in consultation with the joint health and safety committee or the health and safety representative, if any. O. Reg. 629/05, s. 5. 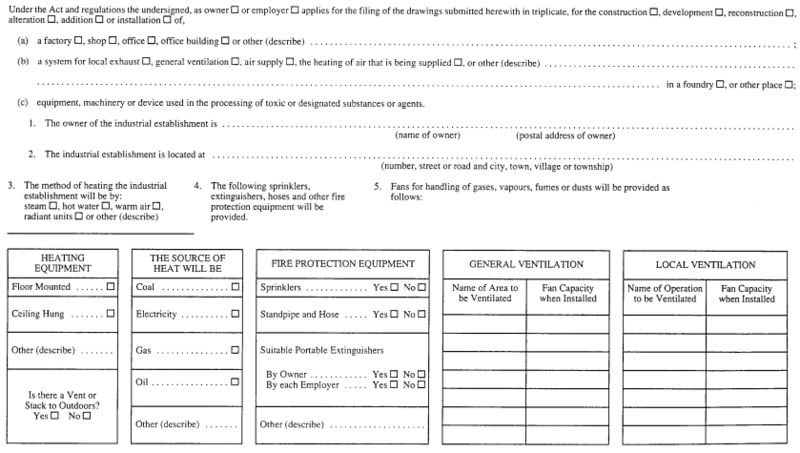 (e) an entry permit system that sets out the measures and procedures to be followed when work is to be performed in a confined space to which the program applies. O. Reg. 629/05, s. 5. (5) The employer shall provide a copy of the program to the joint health and safety committee or the health and safety representative, if any. O. Reg. 629/05, s. 5. (b) every worker who performs work to which the program relates, if the workplace has no joint health and safety committee or health and safety representative. O. Reg. 629/05, s. 5. 119.5 (1) Before any worker enters a confined space, the employer shall ensure that an adequate assessment of the hazards related to the confined space has been carried out. O. Reg. 629/05, s. 5. (b) the hazards that may develop while work is done inside the confined space. O. Reg. 629/05, s. 5. (3) The record of the assessment may be incorporated into an entry permit under section 119.9. O. Reg. 629/05, s. 5. (4) If two or more confined spaces are of similar construction and present the same hazards, their assessments may be recorded in a single document, but each confined space shall be clearly identified in the assessment. O. Reg. 629/05, s. 5. (5) The employer shall appoint a person with adequate knowledge, training and experience to carry out the assessment and shall maintain a record containing details of the person’s knowledge, training and experience. O. Reg. 629/05, s. 5. (6) The assessment shall contain the name of the person who carries out the assessment. O. Reg. 629/05, s. 5. (7) The person shall sign and date the assessment and provide it to the employer. O. Reg. 629/05, s. 5. (b) every worker who performs work to which the assessment relates, if the workplace has no joint health and safety committee or health and safety representative. O. Reg. 629/05, s. 5. (9) The employer shall ensure that the assessment is reviewed as often as is necessary to ensure that the relevant plan remains adequate. O. Reg. 629/05, s. 5. 119.6 (1) Before any worker enters a confined space, the employer shall ensure that an adequate written plan, including procedures for the control of hazards identified in the assessment, has been developed and implemented by a competent person for the confined space. O. Reg. 629/05, s. 5. (2) The plan may be incorporated into an entry permit under section 119.9. O. Reg. 629/05, s. 5. (k) ventilation and purging, in accordance with section 119.19. O. Reg. 629/05, s. 5. (4) One plan may deal with two or more confined spaces that are of similar construction and present the same hazards as identified by the assessment. O. Reg. 629/05, s. 5. (5) The employer shall ensure that the plan is reviewed as often as is necessary to ensure that it remains adequate. O. Reg. 629/05, s. 5. 119.7 (1) Every worker who enters a confined space or who performs related work shall be given adequate training for safe work practices for working in confined spaces and for performing related work, including training in the recognition of hazards associated with confined spaces. O. Reg. 629/05, s. 5. (2) The employer shall appoint a person with adequate knowledge, training and experience to conduct the training. O. Reg. 629/05, s. 5. (3) The employer shall ensure that training under this section is developed in consultation with the joint health and safety committee or the health and safety representative, if any. O. Reg. 629/05, s. 5. 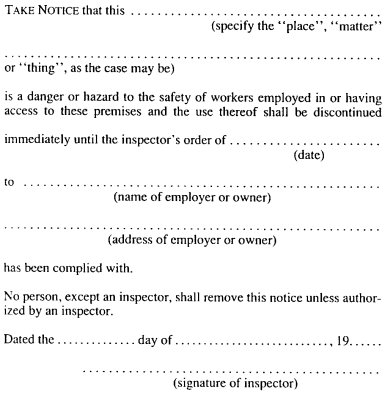 (4) The employer shall ensure that training under this section is reviewed, in consultation with the joint health and safety committee or the health and safety representative, if any, whenever there is a change in circumstances that may affect the safety of a worker who enters a confined space in the workplace, and in any case at least once annually. O. Reg. 629/05, s. 5. (5) The employer shall maintain up-to-date written records showing who provided and who received training under this section, the nature of the training and the date when it was provided. O. Reg. 629/05, s. 5. (6) The records may be incorporated into an entry permit under section 119.9. O. Reg. 629/05, s. 5. (7) Training under this section may be combined with training under section 119.8. O. Reg. 629/05, s. 5. (b) follows the plan. O. Reg. 629/05, s. 5. (2) The employer shall maintain up-to-date written records showing who provided and who received training under this section, and the date when it was provided. O. Reg. 629/05, s. 5. (3) The records may be incorporated into an entry permit under section 119.9. O. Reg. 629/05, s. 5. (4) Training under this section may be combined with training under section 119.7. O. Reg. 629/05, s. 5. 119.9 (1) The employer shall ensure that a separate entry permit is issued each time work is to be performed in a confined space, before any worker enters the confined space. O. Reg. 629/05, s. 5. 5. The name of the attendant described in section 119.14. 8. Results obtained in atmospheric testing under section 119.17. 9. If the work to be performed in the confined space includes hot work, adequate provisions for the hot work and corresponding control measures. O. Reg. 629/05, s. 5. (3) Before each shift, a competent person shall verify that the entry permit complies with the relevant plan. O. Reg. 629/05, s. 5. (4) The employer shall ensure that the entry permit, during the time period for which it applies, is readily available to every person who enters the confined space and to every person who performs related work with respect to the confined space. O. Reg. 629/05, s. 5. 119.10 (1) The employer shall ensure that no worker enters or remains in a confined space unless, in accordance with the relevant plan, adequate written on-site rescue procedures that apply to the confined space have been developed and are ready for immediate implementation. O. Reg. 629/05, s. 5. (2) Before a worker enters a confined space, the employer shall ensure that an adequate number of persons trained in the matters listed in subsection (3) are available for immediate implementation of the on-site rescue procedures mentioned in subsection (1). O. Reg. 629/05, s. 5. (c) the use of the rescue equipment required in accordance with the relevant plan. O. Reg. 629/05, s. 5. (c) inspected as often as is necessary to ensure it is in good working order, by a person with adequate knowledge, training and experience who is appointed by the employer. O. Reg. 629/05, s. 5. (2) The inspection under clause (1) (c) shall be recorded in writing by the person, and the record of the inspection may be incorporated into the entry permit under section 119.9. O. Reg. 629/05, s. 5. (3) The employer shall establish methods of communication that are appropriate for the hazards identified in the relevant assessment, and shall make them readily available for workers to communicate with the attendant described in section 119.14. O. Reg. 629/05, s. 5. 119.12 The employer shall ensure that each worker who enters a confined space is provided with adequate personal protective equipment, in accordance with the relevant plan. O. Reg. 629/05, s. 5. (d) against drowning, engulfment, entrapment, suffocation and other hazards from free-flowing material, by adequate means. O. Reg. 629/05, s. 5. (d) is provided with a device for summoning an adequate rescue response. O. Reg. 629/05, s. 5. (c) summon an adequate rescue response if required. O. Reg. 629/05, s. 5. 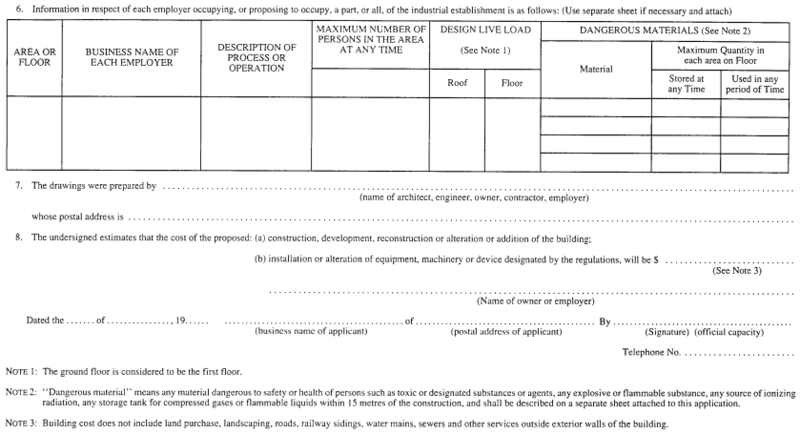 119.15 An adequate means for entering and exiting shall be provided for all workers who enter a confined space, in accordance with the relevant plan. O. Reg. 629/05, s. 5. (b) has been provided with adequate barricades, adequate warning signs regarding unauthorized entry, or both. O. Reg. 629/05, s. 5. 119.17 (1) The employer shall appoint a person with adequate knowledge, training and experience to perform adequate tests as often as necessary before and while a worker is in a confined space to ensure that acceptable atmospheric levels are maintained in the confined space in accordance with the relevant plan. O. Reg. 629/05, s. 5. (2) If the confined space has been both unoccupied and unattended, tests shall be performed before a worker enters or re-enters. O. Reg. 629/05, s. 5. (3) The person performing the tests shall use calibrated instruments that are in good working order and are appropriate for the hazards identified in the relevant assessment. O. Reg. 629/05, s. 5. (4) The employer shall ensure that the results of every sample of a test are recorded, subject to subsection (5). O. Reg. 629/05, s. 5. (5) If the tests are performed using continuous monitoring, the employer shall ensure that test results are recorded at adequate intervals. O. Reg. 629/05, s. 5. (6) The tests shall be performed in a manner that does not endanger the health or safety of the person performing them. O. Reg. 629/05, s. 5. “test” means a collection of samples. O. Reg. 629/05, s. 5. 119.18 (1) This section applies only in respect of atmospheric hazards described in clause (a) of the definition of “atmospheric hazards” in section 119.1. O. Reg. 629/05, s. 5. (2) The employer shall ensure that this section is complied with, by ventilation, purging, rendering the atmosphere inert or other adequate means, in accordance with the relevant plan. O. Reg. 629/05, s. 5. (3) The employer shall ensure that no worker enters or remains in a confined space that contains or is likely to contain an airborne combustible dust or mist whose atmospheric concentration may create a hazard of explosion. O. Reg. 629/05, s. 5. B. The oxygen content of the atmosphere exceeds 23 per cent by volume. O. Reg. 629/05, s. 5. (iii) such other equipment as is necessary to ensure the worker’s safety. O. Reg. 629/05, s. 5. (6) The equipment mentioned in subclauses (5) (b) (i), (ii) and (iii) shall be inspected by a person with adequate knowledge, training and experience, appointed by the employer, and shall be in good working order before the worker enters the confined space. O. Reg. 629/05, s. 5. 119.19 (1) This section applies only in respect of atmospheric hazards described in clause (b) or (c) of the definition of “atmospheric hazards” in section 119.1. O. Reg. 629/05, s. 5. (2) If atmospheric hazards exist or are likely to exist in a confined space, the confined space shall be purged, ventilated or both, before any worker enters it, to ensure that acceptable atmospheric levels are maintained in the confined space while any worker is inside. O. Reg. 629/05, s. 5. (3) If mechanical ventilation is required to maintain acceptable atmospheric levels, an adequate warning system and exit procedure shall also be provided to ensure that workers have adequate warning of ventilation failure and are able to exit the confined space safely. O. Reg. 629/05, s. 5. (5) The equipment mentioned in subclauses (4) (b) (i), (ii) and (iii) shall be inspected by a person with adequate knowledge, training and experience, appointed by the employer, and shall be in good working order before the worker enters the confined space. O. Reg. 629/05, s. 5. 2. The period that is necessary to ensure that at least the two most recent records of each kind that relate to a particular confined space are retained. O. Reg. 629/05, s. 5. (2) If section 119.3 applies, the documents described in subsection (1) shall be retained by the employer responsible for creating them. O. Reg. 629/05, s. 5. (c) within 100 metres of any area where work is regularly performed. R.R.O. 1990, Reg. 851, s. 132 (1); O. Reg. 565/06, s. 1. “equivalent sound exposure level” is the steady sound level in dBA which, if present in a workplace for eight hours in a day, would contain the same total energy as that generated by the actual and varying sound levels to which a worker is exposed in his or her total work day, determined in accordance with the formula set out in subsection (2). O. Reg. 565/06, s. 2.
n is the total number of discrete activities in the worker’s total workday. O. Reg. 565/06, s. 2. (3) Every employer shall take all measures reasonably necessary in the circumstances to protect workers from exposure to hazardous sound levels. O. Reg. 565/06, s. 2. (4) The protective measures shall include the provision and use of engineering controls, work practices and, subject to subsection (7), personal protective equipment. O. Reg. 565/06, s. 2. (5) Any measurement of sound levels in the workplace that is done in order to determine what protective measures are appropriate shall be done without regard to any use of personal protective equipment. O. Reg. 565/06, s. 2. (6) Without limiting the generality of subsections (3) and (4), every employer shall ensure that no worker is exposed to a sound level greater than an equivalent sound exposure level of 85 dBA, Lex,8. O. Reg. 565/06, s. 2. (7) Except in the circumstances set out in subsections (8) and (9), the employer shall protect workers from exposure to a sound level greater than the limit described in subsection (6) without requiring them to use and wear personal protective equipment. O. Reg. 565/06, s. 2. (8) If this subsection applies, workers shall wear and use personal protective equipment appropriate in the circumstances to protect them from exposure to a sound level greater than the limit described in subsection (6). O. Reg. 565/06, s. 2. (d) are ineffective to prevent, control or limit exposure because of an emergency. O. Reg. 565/06, s. 2. (10) A clearly visible warning sign shall be posted at every approach to an area in the workplace where the sound level, measured as described in subsection (5), regularly exceeds 85 dBA. O. Reg. 565/06, s. 2. O. Reg. 629/05, s. 6.